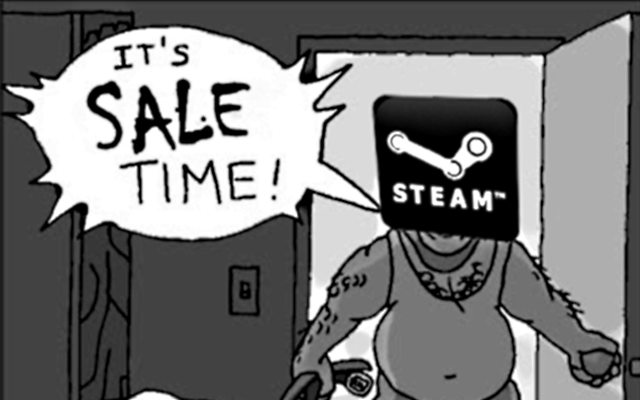 So unless our old friends at Valve are just trollin' again, all odds point to the Steam Summer sale beginning in just a few short hours. Excellent. During Christmas I tried an experiment in which I covered the sales happening with quick little blurbs and thoughts about each of the games. It was a fantastic idea if I was a superhuman, or could afford to spend eight hours every day cropping screenshots and editing links. Obviously it was way too much work, so I ditched the format and spent the rest of my Christmas alone and sloshed on eggnog. But my Yuletide traditions aren't important. What is important is that the idea of helping people make smart buys during Steam sales have become my white whale, and I may have finally crafted a harpoon. As many of you know from either screaming along at home with Amnesia or peer pressuring me into peeing on everything in Postal, I've been working on doing livestreams more regularly. The reasons are two or threefold or so. It's a lot less time consuming than the written word, which means I can do more, or cover games I wouldn't normally have the chance to write about. It's also less time consuming than something like Youtube, where I have to edit things and talk to myself, plus I like the live interaction with people in the chat. It's also really fun, because I get to play games and hang out with cool people who think I'm cool and validate me as a human being and a game reviewing guy. Being just a bit too crazy and overambitious, I decided to swing these two great tastes together. Every day during the Steam sale, I'll hop on to the Backlog Journey Twitch.tv page and broadcast some of the discounted games for an hour or two. During the broadcast, I'll be taking requests from the community for what I should play, so you can get a taste. Want to know if Recettear is a thing you should pick up? Curious about how A Valley Without Wind plays? Can't decide between Magicka and Gemini Rue? After each daily sale begins, either leave a comment here, tweet a request at me, or just show up during the show and heckle me about a game you want to see. So long as I own the game (or it's inexpensive enough to justify), I'll pop it in, play it a bit and discuss how awesome or not awesome it is. Can't make it? Leave a comment anyway, because all of the videos will be saved over on Twitch to look at later. Right now I'm going to shoot for a daily stream beginning at 7PM EDT (that's 11PM GMT for those not all up with the 'Mercian timezones). This is all very loose though, as my full time job and very spotty internet track record could mean I have to shuffle the time around. The best place to know what's up is either via my Twitter feed, or possibly by following me on Twitch. So yes. Good idea? Bad? We'll find out. But it does rely on you folks too, so make me proud and make some requests. Let's see if the wallet can handle this.